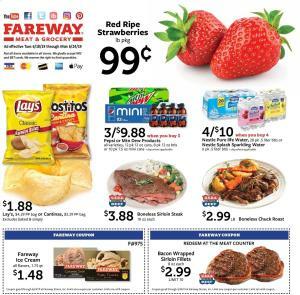 Browse the Fareway Ad to see new coupons, meat, seafood, healthy foods, household supplies, fresh produce, and deals on these products. Save on weekly supplies shopping with using Fareway Weekly Ads. Special discounts of coupons can boost regular savings as well. The store is not trading on Sundays. Also, save with Ibotta which is a free app. With this app you can use rewards and coupons to reduce the costs of items. Unlock rebates, go shopping and give your phone number during check out. You will get real money for your purchases. Fareway Stores operate with 122 locations in Illinois, Minnesota, Nebraska, Iowa, and South Dakota. The store hours can change but some stores can be open at 7:00 AM. You can always browse the Fareway Ad on this page. Subscribe to the newsletter to get emails. 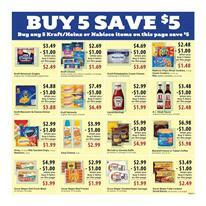 The store has also monthly ads that are similar to weekly grocery savings but a smaller number of items. A lot of multiple-purchase deals, Buy 5, Save $5 deal products, coupon savings, and more are available in the Fareway Ad Grocery Sale. You have Fareway Coupons on the first page. Delightful Farms boneless chicken breasts, NY Strip Steak are both priced at lower values with the discounts of coupons. This ad contains foods that are good for regularly exercising people. Working out to build muscle require certain types of foods that are rich in protein. When you eat a lot of protein but don't eat other things, you might end up lacking some vitamins so that some vitamin from pills might do good to your body. 50% off Sundance vitamins this week at Fareway Ad. You can find much more in the ad. Slam Dunk savings on game snacks are awesome discounts, too. Don't miss out the deals on Beef snack sticks, Tostitos, Fareway beef summer sausage, Fareway heat & eat dips, and more products are also available. Household essentials, bread, beverages, and more snacks are available. Subscribe to get emails about the Fareway Ads and future deals from the new posts.